The sequel to Infomocracy (2016) is not a high tech thriller following a Supermajority elections full of corruptions but a story focused on the aftermath of such an election. It focuses mainly on centenals (micro nations of 100 000 inhabitants) that just joined the micro democracy system and it opens up with the murder investigation of the former governor of the Darfur centenal. The actions mainly takes place in Darfur but also Geneva and China and it was interesting to see how Information differed in various places. 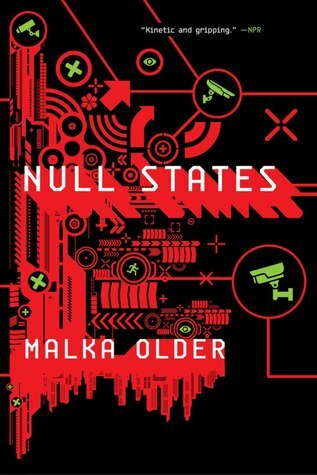 I won’t talk about the plot in any more details just because it would 1) completely spoil Infomocracy and 2) also spoil Null States since not a lot actually happens and it would be too easy to disclose a bit too much about the story and you wouldn’t have much to discover by yourself. I am pretty torn about this book and I don’t really know if I enjoyed it or not. I felt the same way about Infomocracy but I hoped Null States would convice me a bit more. I really admire this series for the worldbuilding, the ideas and the tech. The most interesting parts for me were all the parts about Information: how it worked, how it installed itself in all the centenals and how it influenced the micro-democracy system. All the centenals part of the system have complete access to the Information network but it also means that everything they do is recorded. For people brought up with Information (like all the main characters), being recorded at all time is nothing special and having access to everything in a matter of seconds is as natural as breathing. However, for people new to the system, this constant surveillance is too much and most of them tends to find this quite unsettling if not threatening. In Infomocracy, Information was definitely the “good guy” of the story: an organization that worked in favor of democracy and distributed information to everyone while always being partial. In Null States, we can definitely sense a shift in their role, a lot of their actions are quite questionable and they don’t seem to be supporting the Supermajority goverment as much as replacing them completely, the elected government turning into a figurehead while the real decisions are made elsewhere. This aspect I found fascinationg, however, as I said, I have mixed feelings about this series, my main problem being that I disliked almost all of the characters except two minors characters that happened to be inhabitants of Darfur. I found Ken and Mishima flat and bland and I actively disliked Roz, the main charactre of Null States. I don’t have to love characters to enjoy a book but when they all annoy you and act completely selfishly during the entire book, it starts to get on my nerves. Roz was unbearable, she was rude to everyone including the people she worked with, she was extremely close-minded and couldn’t bring herself to at least attempt to open herself to other cultures and opinions other that her own. She acts like a robot 99% of the time and suddendly transform herself into a cheesy mess when she decides she’s in love with a guy just because she’s attracted to him. I mean I almost gave up on Null States several times just because I was so fed up with Roz’s behaviour. I received a copy of this book through Netgalley. My thanks to Tor.Com. All opinions are my own. Yeah, I suspect you are correct! I have not read either book, but it sounds like one of those series that you either like or you don’t. Unlikable characters can be tough if they don’t have any redeeming qualities.